The 2018 COMIT Annual Conference (#COMIT2018), held at the Hallam Conference Centre in central London, attracted 13 speakers, 9 sponsor-exhibitors and over 100 delegates, over the course of two days. The conference theme was “Digital Construction : Lighting the Way” and Script&Go were delighted to participate. Benoît Jeannin addressed an interested audience on the first day with his presentation “Get Digital. Get Mobile. 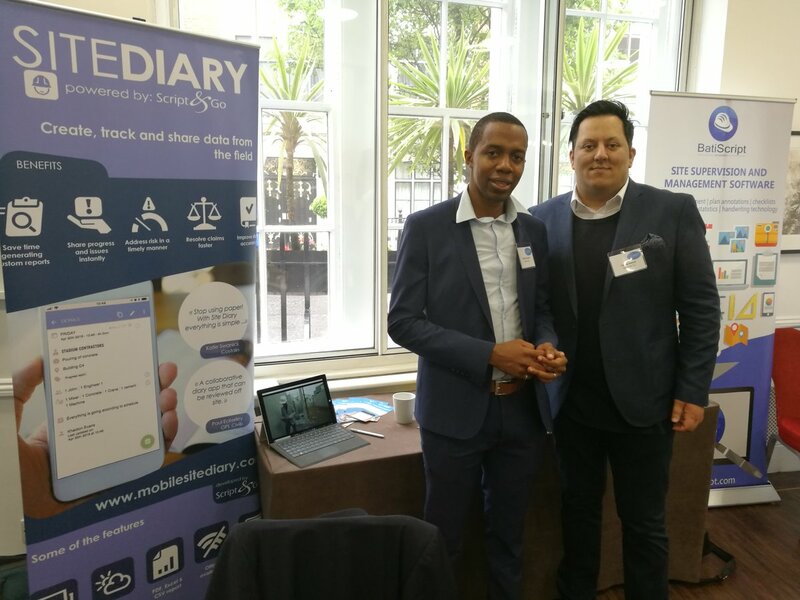 Get Productive.” As Script&Go was a conference sponsor, members of our Script&Go’s UK team also exhibited it’s intuitive easy-to-use BatiScript and Site Diary construction management solutions over the course of the two days. A definition of what Script&Go means by “Digital” and “Mobile”. Intuitive data input methods, including handwriting technology and voice recognition. Questions asked following the Script&Go presentation via audience engagement via use of the Sli.do app. We answer the top ones here. Our answer : Script&Go’s BatiScript solution continuously “learns” from users’ handwriting through Windows recognition motor. See our support FAQ on this topic. Our answer : Script&Go seeks to develop it’s solutions, based on users’ existing ‘habits,’ that are intuitive and easy-to-use and therefore usable by all industry stakeholders, regardless of role, language or intellectual capacity. This reduces the need for extensive training of the software and applications. As much as possible, graphical symbols are used as well as country-specific terminology that users are familiar with. 4. “Once you’ve uploaded the data to the software where is the data that is being stored? What sort of safety systems do you have in place? Our answer : all data collected through Script&Go solutions is securely stored in accordance with Script&Go’s data protection policy and product terms and conditions. Script&Go thanks it’s clients, Groupe Lamotte, Groupe Giboire and Costain for providing valuable testimonials and data for this presentation. Script&Go looks forward to continuing collaboration with the COMIT community and others in the UK construction and real estate sector to assist in the necessary digital transformation and productivity improvement of this field to reap multiple quality improvement benefits. You can look out for us at Script&Go at UK Construction Week in Birmingham this Autumn or contact our UK team – at your convenience – to discuss your need for efficient digital construction management solutions, or need to improve your quality assurance or quality control tasks. Or simply try BatiScript or try Site Diary for yourself today. *For Script&Go UK enquiries : contact our UK team. *For Script&Go technical support enquiries : contact our Customer Support service.